Accessible. Multilingual. Safe & Secure. Mobile ready. Create interactive online forms or complex multi-step eServices. Create custom workflows and logic to streamline your business process. Applicants fill out simple and ease to use forms or upload documents. Users can save submissions and resume where they left of. Completed submissions are proccesed through your business workflow and logic. Users can check the status and be involved in the process. Capture and analyze the data to make better and smarter decisions. Select a form template that requires payment. Select a widget to collect user information, address and payment. Assign a business process or workflow and publish your service. Do all your front-end services do this? No more excuses, they can now. The solution works across all web browsers, and it’s mobile ready. Comes with Government of Canada theme, WET 4, or use your theme for brand consistency. Choose between Canadian English, French, or the 100+ other available languages. Meets GoC strict Accessibility and Security requirements. Tested by the GoC and 3rd party vendors. Protects your current equity, and helps during transitions. 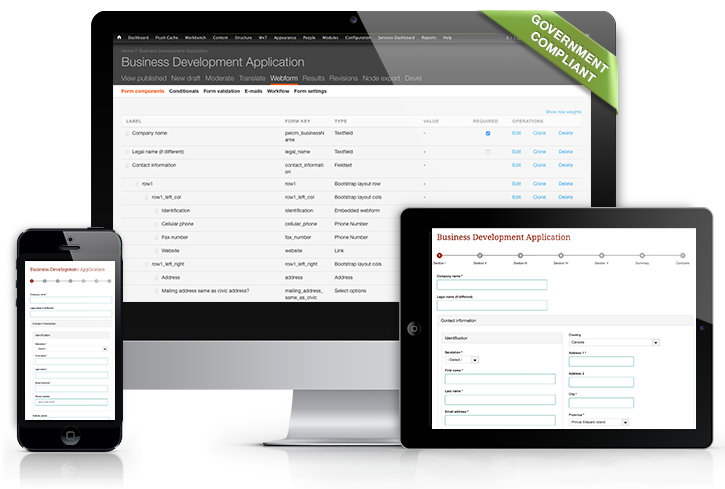 Leverages and integrates with any of your existing enterprise platforms for any service. Whether it's an online form or an eService that needs authentication, or it's open to public. Our solution supports it. Create custom workflows and rules. Have users fill out forms, upload documents and let workflows and rules streamline your process. If you need to collect payments online, our solution integrates with all major payment gateways. Easy to integrate and extend with tools that support RESTful API, WebServices, XML, SOAP, iCal, RSS, etc. Analyze and gain insight into your services. Track user behaviours and growth trends. Push or pull data to any existing systems: BPM, ECM, CRM, Case Systems or Custom Databases and Apps. With options to host on Canadian soil. Turn-key Intranet solution for your team to engage and share productively.